This Cognos interview questions and answers have been created to help professionals clear the Cognos interview. 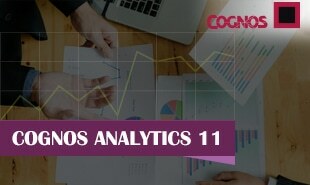 Through this set of interview questions you will get to know what are the characteristics of Cognos, types of reports, framework manager, hierarchies, dimensions, query subjects, facts, Cognos administrator responsibilities and more.Learn Cognos from Intellipaat Cognos Certification training and fast-track your career. It’s nothing but a query item when it is drag and drop into the work area. It’s mainly used in Reporting and for BI Authors it is the most essential object from the framework manager. These have lot of properties associated with them and are present in query subjects. They are similar to subsets of query subjects. 4. Give the advantages of Cognos? 5. Name the types of report? 6. Define Cognos Reporting tool? It’s a reporting tool of IBM which help us in reporting and analysis of different data from a data warehouse.Read this blog to find out why Business Intelligence tools are critical to today’s enterprises. 7. Name the types of gateway? It defines the structure of a cube. Any dimension must have at least one key attribute and other attributes so that it may define hierarchies. 9. Name the types of hierarchies? B) Second is User defined hierarchies. Become Cognos Certified in 16 hrs. It’s a development tool which is used to create the end-user layer used by authors to build their BI objects. It permits one to move from data at the bottom level in a cube to the data in the operational systems from which the cube was derived. 12. Name the three important fundamental themes which are in data warehouse? 13. Which security module used in Cognos? 14. Name the types of studio? 15. What are the initial page components of Cognos connection? 16. Differentiate between prompt and macros? It provides a way to do dynamically changes in the reports. It’s a set of instructions to run the report. It is a complete set of query subjects and query objects that are used for reporting. 18. Differentiate between standalone and embedded filter? To use the filter with only one dimension or query subject. It transforms the data received from the reader buffer and it moves transformation to transformation on row by row basis and it is uses the transformation caches when necessary. 20. Can you delete Cognos Namespace? 21. What are Fact Tables? It is a table that contains summarized numerical (facts) and historical data. It has a foreign key – primary key relation with a dimension table. 22. Differentiate between physical layer and presentation layer? The Presentation layer is made up primarily of model query subjects that you create. 23. Name the types of facts? 24. At what time default data source query subject will be created? At the initial metadata import operation, a default data source query subject is created for those each object you have select. 25. Name the types of Query subjects? 26. What is the way to restrict the tables retrieved by a query Solution? By setting governors we can restrict the tables retrieved by a query solution. 27. Define the term Business Intelligence? BI is a broad category of application programs and technology used for query, by which we can do the reporting and analyzing the business multi dimensionally. Learn more about Business Intelligence in this Cognos Training Videos. 28. Name the responsibilities of Cognos Administrator? Performing the task of backup and recovery of the Meta Data. Interested in taking the Cognos training? Well, we have the comprehensive industry-designed training course. 29. Name the components which get installed at the time of installation of Cognos Report Net Software? 30. Name the phases of Cognos report net workflow? 31. Define the work of Group and Roles? It represents the collection of users that performs the similar task. It is a container for models, reports, and so on. Modelers can create packages in Framework Manager to publish the models to the Report Net server. 33. Name the types of filter in framework manager? 34. What is Model Filter? It is used to restrict the data displayed on the Report. Model filter are reusable. 35. Name the types of filter in the report studio? 36. Name the types of Tabular filter in the report studio? If any dimension will be connected with multiple fact tables then it is called confirmed dimension. 38. What are the steps to import the two data sources in framework manager? It can be done in the Run Metadata Wizard. First of all Go to Run Metadata Wizard–>Select another database ( ex. suppose SQL Server is choose in prior attempt, then you can choose Oracle as new data source). At the last import it. 39. Where the Determinants are used in Cognos framework manager? A query subject that behaves as a dimension has multiple levels of granularity and it will be joined on the different sets of keys to fact data. 40. What is the way to generate cube in framework manager? After creating the IQD file from the framework manager that IQD file will be used by the transformer to generate the cube. 41. What is the way to generate IQD file from framework manager? Using properties pane select externalize. 42. What is the difference between static and dynamic conditions? Whenever you run the report the condition will not change. Condition which keep on change whenever you run the report. It is a key value pair used in creation of conditional Query Subjects. It sub situates the values at the query at runtime. 44. What is the meaning of scrubbing at the Project level? According to the requirements of the report derive the new items with the help of existing Query Items. 45. Define Slice and Dice? An operation that allows one to select a portion of the data of a fact on the basis of specified values in one or several dimensions. 46. Name the types of SQL? 47. What are the advantages of using Cognos SQL? It can contain metadata from the multiple data sources. Provide the facility to interact more effectively with Cognos applications. 48. What are the disadvantages of using Cognos SQL? You can’t enter non standard sql. 49. What actually a project contains? 50. How a project does looks in framework manager? 51. Name the types of OLAP’s? Cognos Certification can help you get ahead in your career. Get an in-depth Cognos Certification training now. "2 Responses on Top Cognos Interview Questions And Answers"
Very nice Cognos Interview Questions with detailed answers and examples.It’s helped me a lot. Thanks to Intellipaat team. 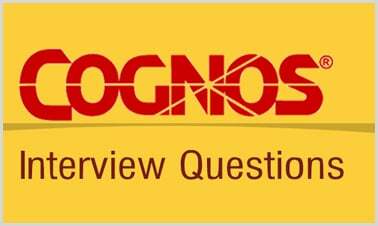 Sign Up or Login to view the Free Top Cognos Interview Questions And Answers.